We are the Midwest”s cargo bike experts. We carry more brands, have more experience and technical knowledge than any other shop in the area. A cargo bike can augment or replace a car for many urban dwellers. There are a variety of types of bikes to help you in using a bike for more trips. Here is a story about Varsity Bike & Transit and cargo bikes by Channel 5 News. The Babboe was created by a group of Dutch parents who wanted to have a quality cargo bike for their families for a reasonable price. They looked at the other products on the market, made improvements, and added features that are important for families. With the help of an engineering company, they created an excellent product that is great looking, fun, practical, and easy to use. Babboe is a real success story, over 20,000 bikes have been sold and the Babboe is now the number one selling cargo bike in Holland. The Babboe City is the bike to replace your car. With its huge front wheelbarrow style box for two kids or anything else, you will never want to drive your car again. It rides surprisingly easy for an 8ft long bike and actually better with some weight in the front. The striking beech wood container has smooth, curved corners and a high edge for added safety. The tires are extra thick, making the cargo bike even more comfortable. The color combination of anthracite grey/cognac together with the cool varnished wooden container gives the Babboe City cargo bike a contemporary and chic look. In the design of the container, an account was also taken of a Maxi-Cosi carrier that was specially developed for Babboe by Steco. This provides room for two children as well as a Maxi-Cosi in the container. Why a 2-wheel cargo bike? With a cargo bike cycling with your children is fun once more! Why so suitable for transporting children? Cycling with your children on a cargo bike is safe, comfortable and practical! Dimensions of container The width of the container tapers off a little. The widest point is 64 cm, which tapers off to ≈ 58 cm. The length of the container is ≈ 99 cm. The Babboe cargo bikes have been tested by SGS (independent testing institute). The weights indicated are the maximum values that were tested. Higher values were not tested. Babboe endeavours to sell top quality cargo bikes at a reasonable price. European (German) beech wood, pressed into curved shape for extra sturdiness and round corners for safety (no sharp edges). The container is made from PEFC hallmark wood (European hallmark for wood). European (Latvian) Birch concrete plywood. The panels are composed of 9 layers of birch veneer of which one in every two layers is glued and finished with phenolic resin. The edges are treated with a crosscut wood sealant, giving the sheets a better protection. When traveling with precious cargo you will want to think about the many high-quality functional Babboe accessories specially designed for use with the Babboe City cargo bike. From child seats to rain covers Babboe has provided nearly everything you need to keep your passengers riding in comfort and style.  While we do carry many of the items listed in the shop we are always able to quickly order something if we happen to sell any specific Babboe accessories. Feel free to give us a call with any questions on availability or stop on into the shop and take a look at what we have on hand. The rain tent protects your children from rain but also wind and cold. Once in place, the boarding is done easily through the large side windows that can be kept open for more comfort in-between seasons. The design of the tent let in lots of light and allows children to see outside. It also allows parents to keep an eye on them and facilitate communication even while pedaling. Rain tent is very easy to assemble and easy to store. It comes with an assembly manual. The rainproof tent is available in grey or dark blue. The rain tent is compatible with our baby and child seats. Just leave a little opening so there is no condensation. Not that you’re likely to need any more cargo capacity than the Babboe City cargo box, but just in case. The Babboe specific rear rack comes in handy when you’ve got a full load of kids and groceries in the front cargo box but you just need to get that one extra package home. Perfect for those who hate making two trips. It is possible that you can not park your Cargo Bike safe and in shelter. To still protect it, we recommend using a protective cover. This cover protects your Babboe Cargobike against the weather. This Maxi Cosi support tray has been specially designed for Babboe City by Steco. The support is suitable for almost all models of Maxi Cosi. 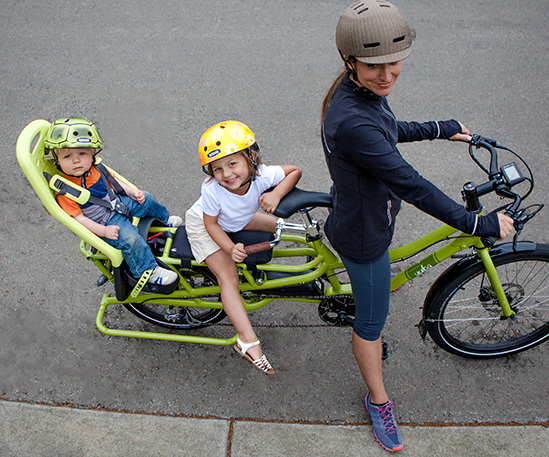 The baby is comfortably placed in your Maxi Cosi and is securely attached to Cargo Bike. In addition, a spring absorb shocks, which ensures optimum support for the child. The box still has enough room to accommodate two additional young children (up to the age of about 4 years) seated on the bench. Maxi Cosi carrier can NOT be used in combination with a comfy baby or toddler seat. A manual and a drill guide are provided for support. With this Comfort Seat, babies can safely be transported in our Cargo Bikes. They occupy much less space than a car seat/ Maxi Cosi types, while providing the necessary security. The seats comes with an installation kit and manual. The cover of the baby seat is very soft and can be machine washed and dried. A cushion that keeps the head better in place is not included with this seat. Two infant seats fit side-by-side on our Cargo Bikes. With one baby seat installed, it is of course also possible for another child to sit beside him. Suitable for carrying babies from two to nine months old. Is your baby slightly older? But yet to young to sit on their own? Then see our seat for toddlers aged 9-18 months. Surly Bikes started in 1998 with an emphasis on high-quality, relatively inexpensive steel frames. They continue to add new bikes to their stable, including mountain, touring, cargo bikes, and trailers. The Surly Big Dummy Longtail Cargo Bike is obviously a long-tail cargo bike, which means that not only can you haul a serious amount of cargo, different accessories can be added to your Big Dummy frame and deck depending on what you want to carry. Being a dedicated single-piece frame, instead of an add-on to an existing bike, it’s stiffer and resistant to torsional flex, which provides a better ride and longer lasting frame than long-tail add-ons. Yuba Bicycles has been consistently innovating and excelling at designing high-quality affordable cargo bicycles for folks and families on the go. In todays car-centered society, Yuba Bicycles has managed to create a number of unique options for getting out of traffic and into some fresh air. From standard longtail designs to multiple electric models, its a sure thing that you'll find a cargo bike just right for you. With a ton of torque and responsive software, the award-winning Yuba Spicy Curry Bosch electric cargo bike is perfect for steep hills or long-distance trips. First and foremost, it comes standard with a state-of-the-art Bosch eBike performance system capable of serious climbing and unparalleled range. It features a low-rider cargo rack and a 20-inch rear wheel to lower the bike’s center of gravity and provide a stable and safe platform for your payload. The Spicy Curry comes with a two-year warranty and you can mount both child seats, seat pads, and mini hold-on bars for added security. The Baguette Bag is similar to the Go-Getter cargo bag with a few twists. It is has a 30 liters capacity (half of the Go-Getter), includes a computer sleeve inside and an outside pocket. The Baguette fits on the Boda Boda V2 or on the Mundo V4 Cargo Bike. The Baguette is compatible with the Yepp baby seat. Attaches to the Boda Boda with hooks; to the Mundo with buckles. The Baguette V2 was designed with three things in mind, being weather proof and making your bike a better looking more practical cargo carrier. For starters, we have made the V2 with a roll-top waterproof closure system, with absolutely no holes for water to sneak through. Combined with sealed seams and waterproof zippers this bag will protect your cargo no matter the conditions. For the appearance, we have used a tweed pattern on the outside panel to give you the looks to compliment your Yuba cargo bike. The all-new Go-Getter easily clips on to the either side of utility rack; it has a strap to help you carry it over your shoulder. With the capacity to hold up to four grocery bags, the Go-Getter is no lightweight when it comes to getting your groceries, backpack, computer, or whatever home, safe and dry. When designing the 2-Go Bags for the Spicy Curry, We thought Hey, what else can we do with our bags? So we came up with some ideas. Adjustable carrying capacity, extra attachment points for a snug fit, internal pockets, what about stirrups for the kids feet? The Ring is the elegant way and safe way for your passenger to grab on when carrying them. Ideal for the Boda Boda it also works with the Spicy Curry(with deck) and the Mundo(with deck). Stylish, elegant and practical the Ring is the ideal accessory for carrying your passengers on Yuba Bikes. You love giving passengers a ride on your Mundo or new Spicy Curry. Our Hold-On kit gives them something to love too: a strong and steady handlebar that will help them be safe and secure while perched atop the bike’s platform. The Hold-On is simple and quick to install. All you’ll need is an allen key. The Yepp maxi is a light and easy-to-use rear child bicycle seat that is designed to carry children from approximately 1.5 years to 6 years of age (up to 48 lbs.). It combines the ultimate cycling stability with comfort and safety by mounting easily behind the bike seat, providing a smooth ride for your little one. Yepp seats are made of a flexible but sturdy rubber material, which ensures both safety and comfort for your child. The material is shock absorbing, antibacterial and easy to clean, and features a high insulation factor and water resistance. Compatible with the new Spicy Curry and Mundo V5. Compatible with the Yuba Mundo V4 and the Boda Boda V2 with Yuba Yepp Adapter only! Order the adapter here. Two kids? No problem. Two Yepp bike seats fit on the Mundo’s rear platform, one in front of the other. Available colors Orange or Black. Bracket for attaching Yepp Easy Fit seat to the Mundo V3, V4s easy Fit seat to the Mundo V3, V4s or Boda Boda V1 or V2. Calling all families! Keep those monkeys safe and secure. That’s the job of Yuba’s Monkey Bars. Fidgety hands may rest anywhere along the Monkey Bars’s aluminum frame; its inner bar for gripping, and its outer bar for protection. Accommodates multiple children with or without the Yepp maxi baby seat. Monkey Bars are compatible with the Yuba Mundo V5 & V4s only. The Mini Monkey Bars mount directly on the rack of the bike and provide safety and protection for passengers. Safely carry two to three kids, the Monkey Bars offer multiple options for holding on. The Bread Basket takes the idea of “bike basket” to a whole new level. Designed to hold two cases of beer or two bags of groceries and rated for 50 pounds of cargo, the Bread Basket is no slacker. Designed for Strength, the Bread Basket bolts directly to the frame of Yuba Bikes. It is extremely stable while riding because it does not turn with the handlebars. How to know if your Mundo is compatible? Tie-down with steel buckle perfect for attaching boxes, surfboards, guitars, tools, and other bikes to a Yuba. Stop the flop! Keep your front wheel in check when using our dual kickstands by attaching the Deflopilator to your down tube. Note: This device doesn’t change the handling of your bike appreciably while riding, unless it is set very tight. This wide and adjustable in height side stand is one of the best side kickstand on the market. Light than the Yuba Stand Alone or Double Stand it performs well when loading large items on one side. The Stand Alone kickstand offers a large and stable base when deployed. It keeps the bike nicely balanced when you are loading it with groceries, kids, kayaks. It attaches to the beefy Mundo or Spicy Curry kickstand plate. Safety of your cargo is essential, this is why we have designed the best double kickstand on the market. The Boda Boda double stand is what makes the entire difference between Yuba Cargo Bikes and wanna be “bikes” that can’t even stand up right. Sometimes the kidlets need a leg up, and that’s what this aptly named accessory does. Designed to help 4-7 year olds climb up onto the seat until their legs are long enough to reach the Sideloader bars, the pegs provide support for littler feet. Easy to install with an Allen wrench size 5. Compatible with Mundo V4 and V5s, V4s frame sets and elMundo BionX. Fitting all v3 and v4 models, the towing tray makes it possible to bring along any bike from a 12? up to a 29er, with a tire width of up to a 2.25?. It is made out of the same material as our Utility decks _ recycled milk jugs _ and is durable and tough. A side bumper will keep the towed bike from scratching your Mundo. Towing tray kit includes running board with a slot for front tire, adjuster for 20? 16? or 12? tires, and bumper. When you say Cargo, we ask how much? With the Carry-On, that’s no longer a question! With the Carry-On you can now create a sturdy platform that can handle the biggest and bulkiest loads. Role in style. Practical and stylish the Bamboo Running Boards for Mundo are a must have add-on when carrying passenger. They match the Bamboo deck and provide more comfort for your passengers or better support for cargo. Our running boards provide the perfect support for your passenger’s feet, while doing a bit to support the planet too. Each pair is made from recycled milk jugs, so you (and your passengers) can rest a little easier. Note: Running Boards are compatible with all Mundo versions V3 and above. You don’t know which version you own? Check here! The Bamboo Running Boards for the Boda Boda V2 are a stylish Add-On. They match the Bamboo deck and provide more comfort for your passengers or better support for cargo. These sleek running boards create a platform for a passenger to rest their feet in style while they enjoy the ride and take in the scenery.